Internet retailer Amazon will definitely not build a new head office in Queens borough in New York. The technology giant will not do it after criticism by politicians in New York, who are not happy with all the municipal subsidies that the rich company could get. The web giant will continue to build offices in Arlington, Virginia and in Nashville, Tennessee. A woman has been rescued after spending an entire weekend trapped in her billionaire employer’s lift, authorities said. The woman, reported to be 53-year-old Marites Fortaliza, entered the elevator at the Manhattan townhouse owned by investment banker Warren Stephens on Friday evening. On Monday, January 28, Marites Fortaliza, a housekeeper was rescued from a broken elevator in a townhouse on Manhattan’s exclusive Upper East Side. She had been trapped for at least 60 hours in the New York residence of the family of Warren Stephens, a billionaire hedge-fund manager based in Arkansas. A resident of Queens, Fortaliza had been cleaning the townhouse on the previous Friday, when the elevator became stuck between the second and third floors. Fortaliza was the only person in the building and remained trapped throughout the weekend without food or water in what was essentially a three-foot-by-four-foot metal box. When a courier attempted to deliver a package on the following Monday and received no response, he called the building’s owners, who had been away for the weekend. The Stephenses dispatched a family member to the house, who called 911 when she realized that Fortaliza was trapped inside the elevator. Firefighters arrived at about 10 a.m. and forced open the elevator doors. When she was carried on a stretcher from the building, Fortaliza appeared calm, according to bystanders. Although her condition seemed good, she was taken to the hospital, where she stayed “to get a good rest,” according to her husband. Fortaliza’s hospital stay was necessary because, even after a relatively short period of solitary confinement such as she endured, a person’s physical health begins to deteriorate. Symptoms like those of hypertension, such as chronic headaches, trembling, and heart palpitations, can develop, along with oversensitivity to normal stimuli. Mental health declines, as well. A person can lose the ability to think clearly or concentrate and may suffer hallucinations. Other potential negative psychological effects include panic, rage, anxiety, and thoughts of self-harm and suicide. Warren Stephens is from a social stratum whose privileges are light-years away from those of Fortaliza and her family and neighbors in Queens. He is president, chair, and CEO of the Stephens Inc. investment bank that his father and uncle founded in 1933. During his career at the bank, Stephens has aided various major companies that are as remorseless as they are profit-hungry. Notable examples include his facilitation of the initial public offering of Wal-Mart and his advising of Tyson Foods in its battle to acquire Holly Farms. Stephens obtained all the outstanding shares in the family business from his other relatives in 2006, and Forbes magazine now estimates his net worth at $2.6 billion. Over the years, Stephens has supported the political campaigns of reactionaries such as Bob Dole, Steve Forbes, and Mitt Romney: all staunch defenders of corporate bandits and financial parasites. In 2016, he belonged to the anti-Trump faction of the Republican party. But this turned out to be one of the lies that this layer of the richest Americans spouts out in great quantities every day, as subsequent events showed when, later that Monday, Devon Simmons, a Department of Buildings inspector for New York City, arrived at the Stephens townhouse to conduct tests on the elevator to identify the cause of the elevator’s breakdown. He knocked on the front door but was not admitted into the building. If a building is not monitored continuously, its elevators are required to have buttons or phones that can call for emergency assistance. Simmons did not know whether the elevator in the townhouse was equipped with these features or if they were in working order. It seems unlikely, since Fortaliza would have used them to summon help. Because Simmons was not admitted inside, the Department of Buildings issued a violation later that day. Notably it was not the first; the building was the subject of a previous violation under Stephens’s ownership in 2008. This incident perfectly encapsulates the relationship between the thin layer of the super-rich, many of whom have second, third, and fourth homes in Manhattan and elsewhere around the country and the world, and the working class. While the financiers and corporate bosses relax on weekend getaways, their employees toil unseen and unconsidered. Proper workplace maintenance and safety precautions are neglected or eliminated when they do not concern the personal safety of the owners. Civil fines are ignored or brushed aside, and inspectors are turned away. Instead of enjoying the standard of living, cultural opportunities, social lives, and medical care that the ruling class enjoys, the workers who create all of the wealth in society suffer accidents made possible by their bosses’ neglect. These accidents unfailingly prompt stern vows to investigate and prevent future horrors, only to recur at regular intervals. Unlike thousands of other workers who die on the job every year in the United States, Fortaliza is lucky that the accident she suffered was not fatal. Members of a Jewish antifa group defaced a plaque on Monday in New York honoring a French leader who collaborated with the Nazis during World War II. The plaque in the Canyon of Heroes in Lower Manhattan honored Philippe Pétain, a French general in World War I who later led the Vichy regime, which oversaw the deportation of more than 75,000 Jews to concentration camps, the vast majority of whom were killed. 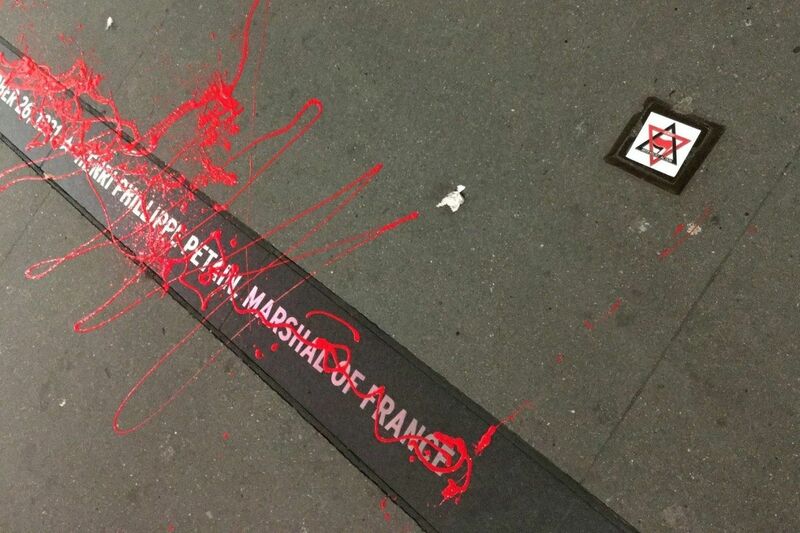 The plaque commemorating Pétain’s 1931 parade in the “Canyon of Heroes” was splattered with red paint on Monday, the day after International Holocaust Remembrance Day, by the group Jewish Antifascist Action. They also covered the surrounding area with other antifa-related graffiti. “With Monday’s actions, Jewish antifascists and allied forces have served notice that fascist apologism will not be tolerated in our city in 2019; that anti-Semitic ideology and violence will be confronted with Jewish solidarity and strength; and that the Holocaust will be remembered not only with sadness and grief but also with righteous anger and action: ‘We will never forget. We will never forgive’”,the group said in a statement. The group added that its action was done in solidarity with the Outlive Them Network, an international antifascist group that has called for global actions over the next few months. The network previously inspired actions in 18 across seven countries last November on the anniversary of Kristallnacht. Former New York state assemblyman Dov Hikind pushed for the plaque honoring Pétain to be removed in 2017. Mayor Bill de Blasio announced later that year that the plaque would be removed, but the removal has not yet occurred. Human rights activism on Statue of Liberty, criminal? Anti-Trump activist Therese Patricia Okoumou chats with Jezebel about her protests against the Trump Administration. A woman has been found guilty of several federal offenses after climbing onto the base of the Statue of Liberty on the Fourth of July this year to protest the Trump administration’s immigration policy, including the separation of families at the border and the jailing of migrant children. Magistrate judge Gabriel Gorenstein convicted Therese Patricia Okoumou on Monday afternoon after a one-day bench trial, insisting that Okoumou’s political and moral motivations were not justifiable before the law. charges, including trespassing, interfering with government agency functions, and disorderly conduct, carrying a sentence of up to 18 months in prison. At the beginning of her trial, Okoumou said the treatment of children at the US-Mexico border prompted her to make an aggressive statement by climbing the Statue of Liberty. “I wanted to send a strong statement that children do not belong in cages”, she said. After convicting Okoumou, however, Judge Gorenstein claimed that he would be undermining the rule of law if he did not find Okoumou guilty, despite her political reasoning. According to Gorenstein, it would violate his oath as a judge if he considered Okoumou’s motivations for her alleged crime. During the trial, the prosecution focused entirely on the supposed illegality of Okoumou’s actions. 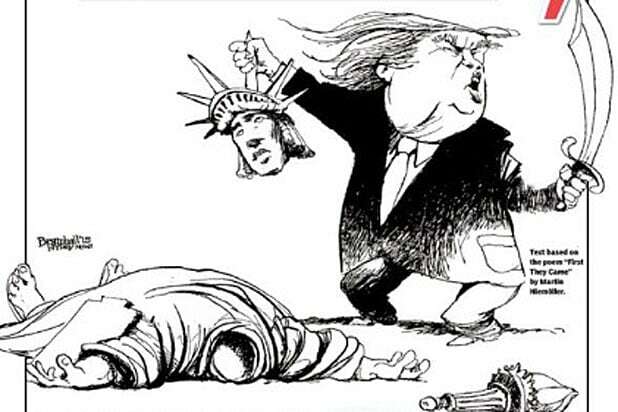 Dear Mr Berman, Dr Mr Gorenstein: what about what Donald Trump did to Lady Liberty and to the values she stands for; as depicted in this New York Daily News cartoon? Do you hold him accountable? Judge Gorenstein’s assertion that the law must be upheld is ludicrous. The laws set and made within the United States are interpreted for the benefit of the capitalist order and the ruling class. Okoumou was indeed exercising her First Amendment right to protest the inhumane treatment of migrants, but this was seen as inexcusable by the US government. It is no accident that Okoumou was found guilty shortly after the death of 7-year-old Jackeline Caal in the custody of US Border Patrol. Okoumou’s conviction is a message meant to intimidate anyone who opposes the terror practices meted out by the government against migrant workers and their families at the border and across the country. Although the Trump administration reversed its policy of separating children from their parents upon crossing the border, it reportedly continues to do so by various means, and is also detaining children who have crossed the border unaccompanied. Nearly 15,000 migrant children are currently being held in detention camps across the US. Okoumou told reporters she was not discouraged by the verdict and would continue to fight for the rights of immigrants. American border officers have thrown gas canisters at dozens of people – including women and children – who tried to cross the Mexico-US frontier between Tijuana and San Diego. Children were screaming and coughing in the mayhem after teargas was fired following an attempt by a few migrants to breach a fence. On Sunday some 250 people protested inside the Whitney Museum of American Art, one of New York City’s leading cultural institutions, and demanded the removal of Warren B. Kanders, the vice chairman of the museum’s board of trustees. Kanders is the chairman and founder of Safariland, a defense firm that produces the tear gas used in the unprovoked police-military attack on migrant workers at the US-Mexico border crossing in San Ysidro, south of San Diego, on November 25. The demonstration followed the issuing of an open letter signed by more than 100 Whitney staff demanding Kanders’ resignation. The relationship of Kanders to the firm was exposed at the end of last month by the contemporary art website Hyperallergic, which noted that photographs of spent tear gas canisters used against women and children at San Ysidro were clearly marked Safariland. This 2015 video is called An Exclusive Walk Through the New Whitney Museum Building. Kanders responded by disclaiming responsibility for the use of the products his company makes. The response only increased the anger of the staff and helped build Sunday’s protest. “Nonlethal” weapons such as these are meant to harm, frighten and intimidate groups of people in the US and on its border and in a whole range of countries whose governments are Safariland’s customers. There are no innocent uses of these devices. Forbes noted recently that Kanders “has made a fortune over the past three decades building a diversified network of defense equipment companies whose customers include the U.S. government as well as U.S. allies including Turkey, Bahrain, Kuwait, and Israel.” The US Department of Homeland Security is also one of the firm’s customers. In the fiscal year that ended in 2017, Kanders’ total compensation was $2.3 million. In his letter responding to the protests against his role at the Whitney, Kanders presented a blanket defense of the actions of his company, the police and military. The brutality of the American state at the border on November 25 was shocking and disturbing to millions in the US and internationally. But extreme violence is the mode of US military and intelligence operations on a daily basis. The bombing and invasion of Syria by American troops and proxies, the supplying of weapons to the Saudi genocide in Yemen and assassinations in Afghanistan are business as usual for US imperialism. At home, police kill more than 1,000 people, white, black and immigrant, a year. The presence of multimillionaire and billionaire magnates like Kanders on the boards of museums and other cultural institutions has now become the norm, as the financial aristocracy asserts itself in every field of cultural life. Such figures include BlackRock magnate and billionaire Laurence Fink, who sits on the Board of Trustees of the Museum of Modern Art, and war criminal Henry Kissinger, Trustee Emeritus of the Metropolitan Museum of Art. Short film about human rights abuses by the government of the UAE against democracy activists, foreign businessmen, and their families. At the faculty forum, titled “NYU, UAE, & Academic Freedom”, three faculty members who had experience with NYUAD and the UAE government spoke, followed by contributions from the floor. The common theme was that academic freedom was anything but sacrosanct in both the UAE and at NYUAD, and that the NYU administration is fully aware yet continues to claim otherwise. While the arrest of Hedges was a nodal point in the attacks on academic freedom by the UAE, it was hardly the first time academics had been harassed for their work by the federation of sheikdoms. Minsky provided a timeline of the sordid NYU-UAE “partnership”, including how NYU walked back on promises of academic freedom shortly after the campus began operations by creating a facile distinction between academic freedom and freedom of speech. Minsky described how, after her arrival in the UAE, she noticed how the boxes containing her research materials had been opened and everything was in disarray. “They had clearly gone through everything”, she noted. Some of her husband’s English- and Hebrew-language books were confiscated. She described extensive “direct harassment of faculty teaching at NYU Abu Dhabi”, Minsky noted that she was followed for hours in her car—with her infant on board—by an unmarked vehicle that she believes was associated with the regime’s security services. Harassment has only escalated over the past couple of years, Minsky told the meeting, with the campus suddenly declared a “public space” by the government. All public events that people unaffiliated with NYU could attend had to be approved. “From my perspective, it’s almost like the [UAE] government is taking over the institution, and I don’t say that lightly”, she explained. Ross emphasized that genuine academic freedom extends to speech that is critical of university administrations and extends beyond the walls of the university. “One of the duties or obligations of our profession’s members is to share our knowledge and opinions with the public”, he said. Keshavarzian stressed that the UAE was an absolutist monarchy from its founding in 1971 through to NYU’s decision to construct a liberal arts college in the country, and remains so today. However, the UAE’s authoritarianism made NYUAD possible, including the brutal exploitation of labor to construct the campus. “NYU entered into this arrangement because of the UAE’s illiberal system, not despite it”, Keshavarzian explained. The IYSSE at NYU will discuss these issues at its next meeting, “NYU Administration Backs the UAE: The Way Forward to Defend Academic Freedom”, which will be on Tuesday, December 11 , at 6:30 p.m. in room 910 of the Kimmel Center at NYU. Faculty, students, staff and others seeking a socialist strategy to defend democratic rights are invited to attend.